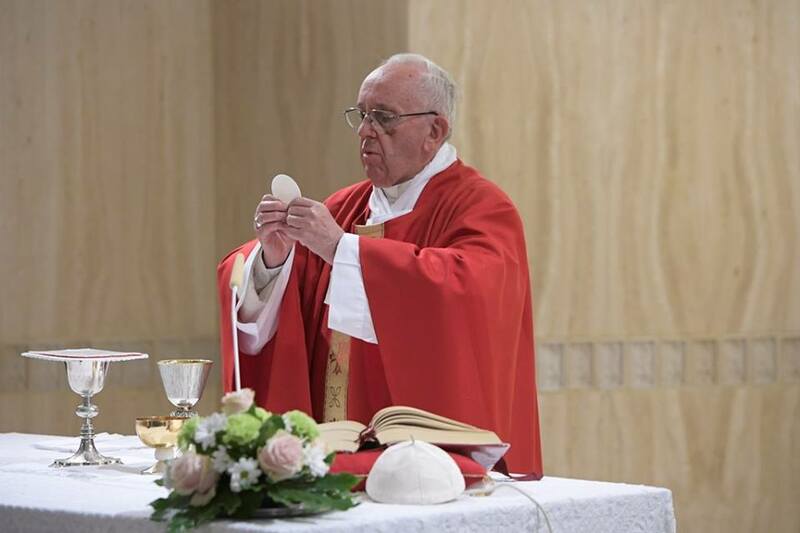 This morning in his homily during Mass at the Casa Santa Marta, Pope Francis dwells on the three ways of living poverty in the life of the Christian and reflects that even today there are many Christians persecuted for the Gospel. In this morning's Mass at the Casa Santa Marta, the Pope speaks of the three forms of poverty to which the disciple is called: the first is to renounce riches, with a heart detached from money, the second is to accept persecution, large or small, even slander, because of the Gospel, and the third is the poverty of loneliness, to feel alone at the end of life. His reflection begins with the Collect Prayer, which emphasizes that through Saint Luke, the Lord wanted to reveal his predilection for the poor. The Gospel (Lk 10:1-9) then speaks of the sending of the 72 disciples into poverty - "do not carry a purse, bag or sandals" - because the Lord wants the disciple's path to be a poor one. The disciple attached to money or wealth is not a true disciple. Pope Francis' entire homily is, therefore, marked by the "three stages" of poverty in the life of the disciples, the three ways of living it. The first, in fact, is that of being detached from money and wealth and is "the condition for beginning the path of discipleship". It consists in having a "poor heart", so much so that "if in the apostolic work there is a need for structures or organizations that seem to be a sign of wealth, use them well - but be detached", the Pope warns. The rich young man of the Gospel, in fact, moved the heart of Jesus but was then unable to follow the Lord because he had "his heart attached to riches". "If you want to follow the Lord, choose the path of poverty and if you have riches because the Lord gave them to you, to serve others, your need to be, detached from them. The disciple must not be afraid of poverty, on the contrary: he must be poor", Pope Francis states clearly. Yesterday, in the Synod Hall a bishop from one of these countries where there is persecution spoke about a Catholic boy taken by a group of boys who hated the Church, fundamentalists; he was beaten and then thrown into a cistern with mud thrown on him until it came up to his neck. : "Say for the last time: do you give up Jesus Christ? - "No!". They threw a stone and killed him. We have all heard it. And this is not from the first centuries: this is from two months ago! It's an example. How many Christians today suffer physical persecution: "Oh, that's blasphemy! To the gallows!". Pope Francis then recalled that there are also other forms of persecution: There is the persecution of slander, of rumours, and the Christian tolerates this "poverty" in silence. Sometimes it is necessary to defend oneself so as not to cause scandal... The small persecutions in the neighbourhood, in the parish... small, but they are the proof: the proof of poverty. It is the second form of poverty that the Lord asks of us. The first, to leave riches, not to be have ones heart attached to riches; the second, to accept humbly persecution, to tolerate persecution. This is a form of poverty. I think of the greatest man in humanity, and this definition comes from the mouth of Jesus: John the Baptist; the greatest man born of a woman. Great preacher: people went to him to be baptized. How did it end? Alone; in prison. Just think, what of a cell and what were the cells of that time like, because if they are now like that, think of those ... Alone, forgotten, slaughtered for the weakness of a king, the hatred of an adulteress and the whim of a girl: that’s how it ended for the greatest man in history. And without going that far, many times in old people's homes where there are priests or nuns who have spent their lives preaching, they feel alone, only with the Lord, no one else to remember them. There is a form of poverty that Jesus promised to Peter himself, telling him: "When you were a boy, you went where you wanted; when you are old, they will take you where you do not want to go. " The disciple is, therefore, poor, in the sense that he is not attached to riches and this is the first step. He is then poor because "he is patient before small or large persecutions", and - third step - he is poor because he enters into that state of mind of feeling abandoned at the end of life. In fact, Jesus' own path ends with that prayer to the Father: "Father, Father, why have you forsaken me?". The Pope's concluding invitation is, therefore, to pray for all the disciples, "priests, nuns, bishops, popes, laity", so that they "may know how to walk the path of poverty as is required by the Lord ".